Aside from lower per minute call charge to all-net which is now only P1, Globe also offer call to all network promo for only 50 pesos. If you’re familiar with GOCALL 100 before that only gives you 500 minutes of call to Globe and TM for 7 days, this new GoSAKTO GoCall50 lets you call to any local mobile networks in Philippines without worrying about extra charges and load balance requirements. Your P50 is enough to make a call for 50 minutes that is consumable for 3 days. It’s now very affordable to access and interconnect calls with Globe prepaid, postpaid and TM (Touch Mobile) subscribers. If you’re on a postpaid under 2499 plan and up, you can avail 300-minute calls to all networks for only 299 pesos. For TM subscribers, you can add up 5 pesos to any of the existing call and text promo to get 5 minutes call to all networks valid for 1 day. 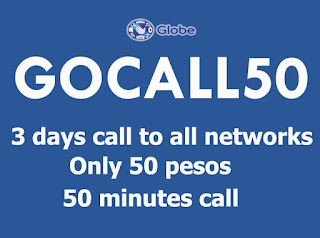 For Globe prepaid, you can register on call to all networks by using the keyword GOCALL50. Just reload your account with 50 pesos regular load, follow the registration method above then wait for the confirmation message before you start using GOCALL50 promo. You can also do the USSD code registration method as soon as it’s already available on the *143# menu list of call promo offers.